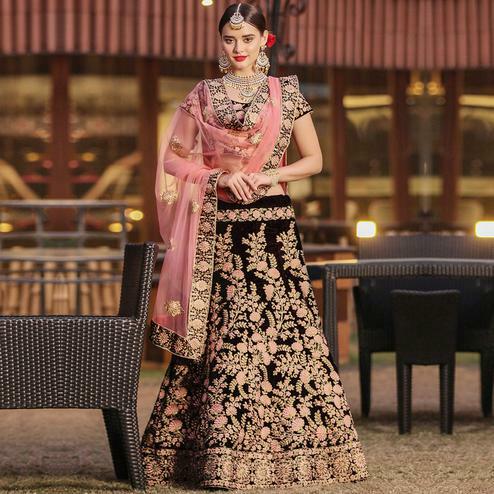 Peachmode’s collection of ethnic and contemporary lehengas online is fabulous and extremely stylish. 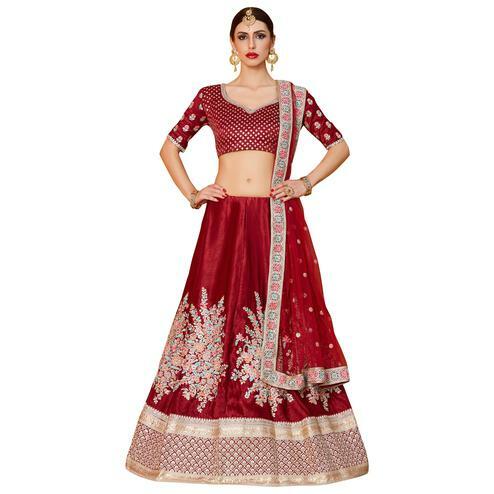 These lehengas come in a series of lehenga designs in lavish fabrics and attractive colors. One such alluring color from the collection is maroon. 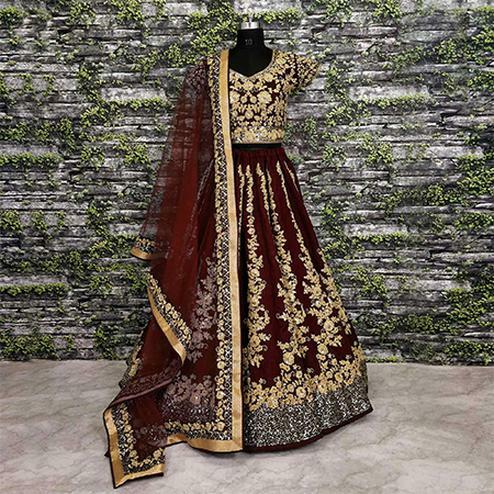 These maroon lehengas come in style patterns of ghaghra choli, lehenga kameez, anarkali style lehengas, gown style lehengas- you will be spoilt for choice with our exhaustive collection. 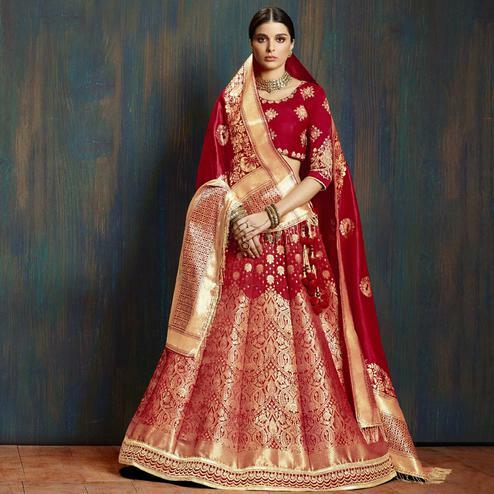 The color maroon in itself has a very royal and regal appeal to it. Made from the colors red and purple, maroon has the warmth and passion of red and the very vibrant and lively feel of purple. Maroon is considered to be a very creative and energy boosting color. 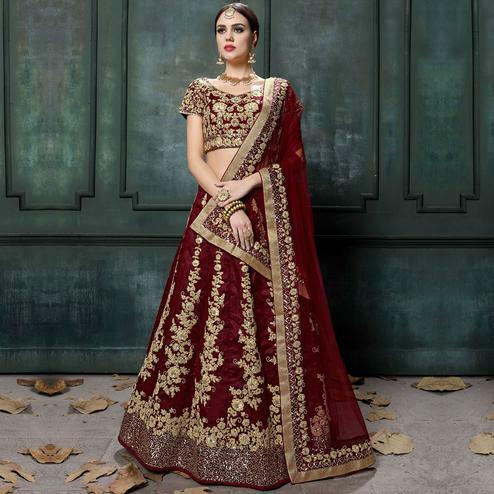 Maroon lehengas at Peachmode are absolutely stunning as bridal lehengas and wedding lehengas. 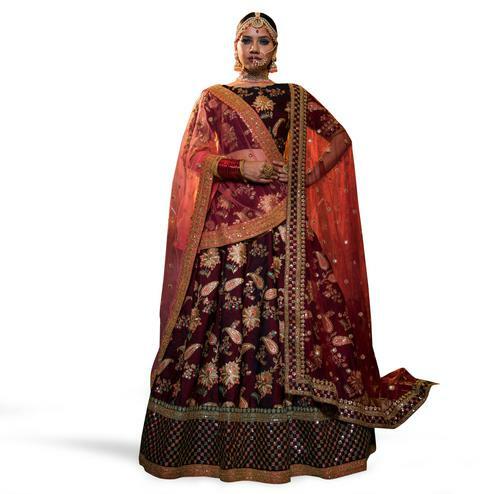 Our dark maroon bridal lehengas with detailed work has all the nuances of perfection in their craftsmanship. 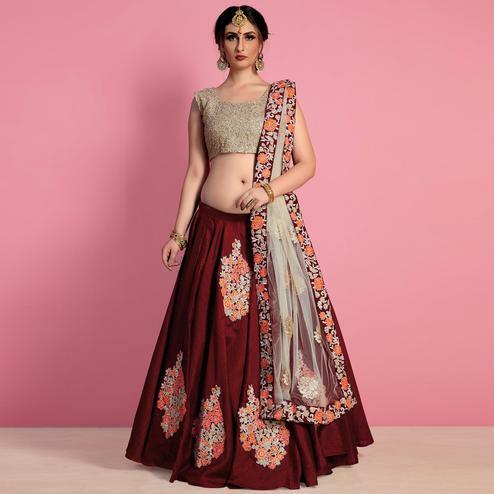 Our maroon lehengas are crafted beautifully on luxurious fabrics like banarasi silk, raw silk, satin, velvet, mulberry silk, slub silk, banglori silk, pure silk, georgette, faux georgette, art silk, jacquard, net and other wide range of fabric choices. 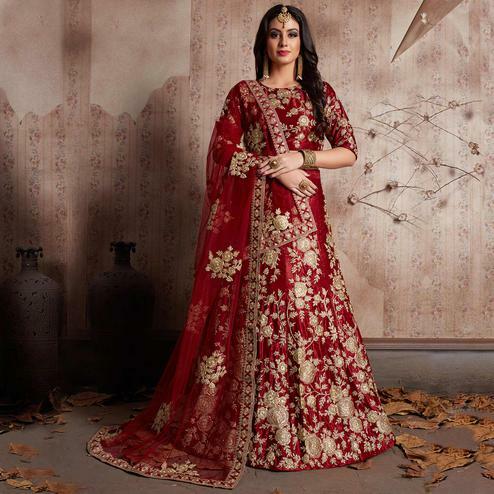 Bequeathed with detailed work like sequins work, zari work, dori work, lace work, embroidery, resham work, floral embroidery, stone work, pearl work, thread embroidery, zari embroidery, hand stone work, weaving, zari thread embroidery, all our lehengas are simply stunning pieces of elegance and glamour. 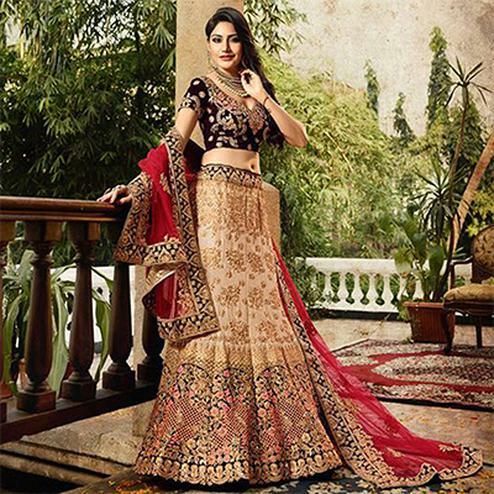 You will find all the trending latest lehengas at Peachmode! 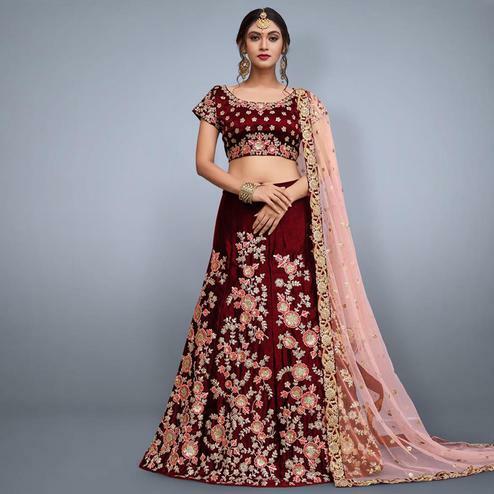 The maroon lehengas in combination colors of peach, beige, white, off white, green, black, light pink further enhance their beauty. 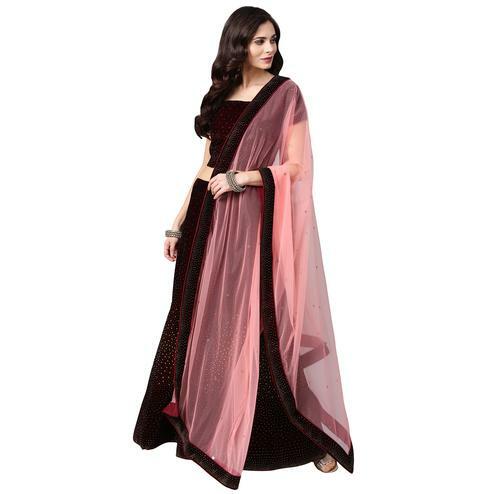 Our maroon lehengas with peach and pink dupatta are highly recommended and amongst our high selling ethereal outfits. 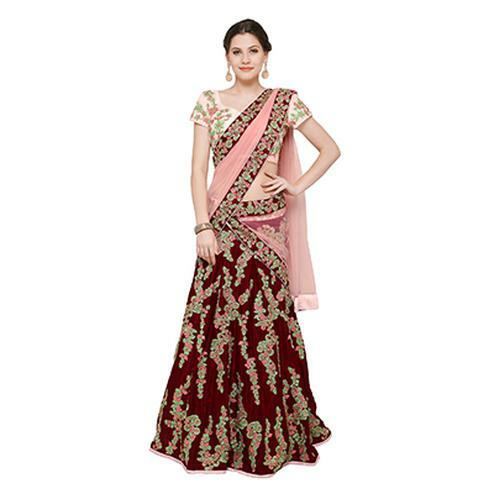 Do check out our maroon lehengas with golden blouse in satin- they are sheer beauty! 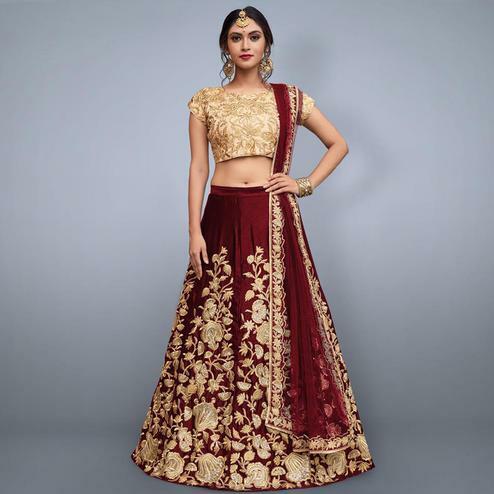 We at Peachmode have got you the best maroon lehengas online at great discount offers, you just have to grab them before anyone else!